The MSC Bellissima is now officially at sea! The newest flagship of MSC Cruises was christened on the 2nd of March in Southampton, UK, and with an impressive capacity enough to accommodate 5,686 guests, that makes the sister ship of the MSC Meraviglia the largest ship to ever be named at the British port. The festivities really did the ship’s name justice – Bellissima meaning “the most beautiful” in Italian – with spectacular live entertainment that delighted attendees from all over the globe. We were invited to attend the ceremony and would love to share our first impressions of the second ship in the innovative Meraviglia class as well as some highlights from the christening. What really sets the MSC Bellissima apart from the rest of the fleet is her state-of-the-art technology. 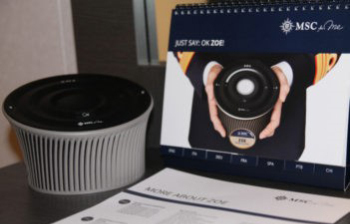 Every stateroom is equipped with ZOE, the first ever voice-controlled digital cruise assistant. ZOE can speak seven languages and has the ability to answer guests’ questions and provide helpful information about onboard amenities and services. Furthermore, ZOE can even reserve a table at a restaurant or book a shore excursion. Embedded in the touchscreens around the ship, the interactive stateroom TVs, and the app, MSC for Me connects guests to their friends and family on board and helps them plan and personalise their cruise holidays. The twelve restaurants and 20 bars on the MSC Bellissima ensure that no one’s stomachs or glasses are empty. Speciality restaurants, such as L’Atelier Bistrot and Butcher’s Cut just to name a few, serve up mouth-watering international cruise. 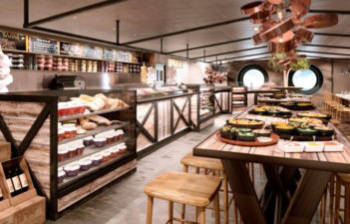 On deck 6, two-Michelin Star chef Ramón Freixa serves up Mediterranean small plates at the new tapas bar ¡HOLA! Whether in a relaxed lounge or at a busy bar, drinks are always served cold. The naming ceremony, hosted by English television presenter Holly Willoughby, included a moving performance by father-and-son duo Andrea and Matteo Bocelli and a jaw-dropping Cirque du Soleil at Sea show, produced exclusively for MSC Cruises. A ribbon cutting would have surely given the 2,500 guests goose bumps; however, due to the strong winds of Storm Freya, the festivities, unfortunately, had to be postponed and relocated to the ship’s promenade. There, MSC’s executive chairman Pierfrancesco Vago and famous Italian actress and MSC Cruises’ godmother Sophia Loren christened the MSC Bellissima by breaking the ceremonial bottle of champagne. 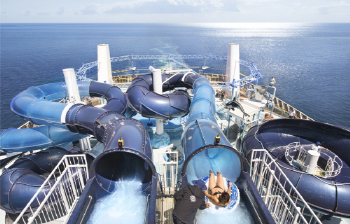 Here’s our list of the top ten things to do on the MSC Bellissima! Guests can book seats in the Carousel Lounge to experience two new Cirque du Soleil at Sea shows, SYMA – Sail beyond Imagination and VARÉLIA – Love in Full Colour. 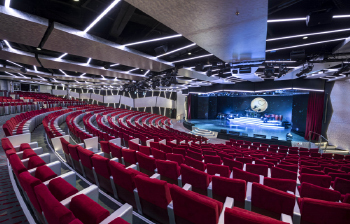 The shows, scheduled twelve times a week, were produced exclusively for MSC Cruises. Pastry chef Jean-Philippe Maury brings his award-winning talents to the Chocolate Bar where guests can watch confection masterpieces being created right in front of their eyes. Non-chocolate fans need not fear as the Galleria Bellissima is home to both his gourmet ice cream parlour and French-style creperie. A serene haven dedicated to guest relaxation, the Aurea Spa provides classic spa treatments, salon services, and beauty treatments. Guests can browse the full range of relaxation methods from up to 20 types of massages, couples’ rituals, 19 body treatments, and 19 facial treatments. What makes the Aurea Spa of the MSC Bellissima so special is its interior. Inspired by Balinese décor, the therapeutic sounds of waterfalls and organic design with natural stones and wood greet guests as soon as they enter. Guests looking to get their hearts racing should head to the Formula 1 simulation. They’ll be able to immerse themselves in a virtual driving experience without setting foot off of the ship. 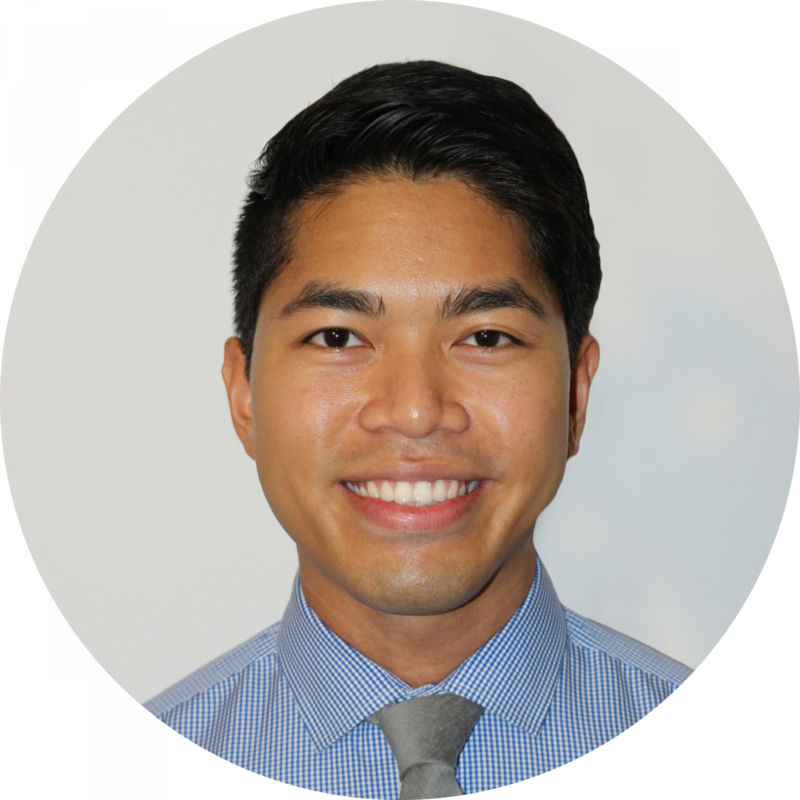 More competitive guests can even compete head-to-head. For a touch of style and glamour, suave waiters pop bottles of champagne and prosecco from all around the world at this posh bar. While guests are sipping away, they can also enjoy suitably luxurious dishes, such as caviar, crab, and oysters. A variety of shops, eateries, and bars line the 96-metre-long Galleria Bellissima promenade. The cosmopolitan atmosphere on the promenade during the day is replaced with live music and entertainment as the evening approaches. 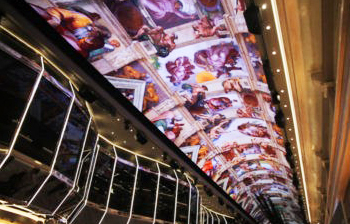 Guests walking the Galleria Bellissima also have an outstanding view of the 80-metre LED dome above. The Sky Screen changes every few minutes and displays breathtaking scenes like glorious sunrises and starry night skies. Master chefs prepare authentic Japanese specialities fresh right in front of guests at the trendy Kaito Teppanyaki Restaurant. Just outside is the Sushi Bar, offering amazing views overlooking Galleria Bellissima. The Atmosphere Pool aboard the MSC Bellissima offers guests plenty of poolside space. For open-air deck space, the Horizon Pool is the perfect place to be. At night, the Horizon Pool offers many entertainment options. Up to 200 brands have set up shop along the Galleria Bellissima promenade. In 2018, the Frontier Awards named MSC Cruises the Cruise & Ferry Line Retailer of the Year, so shopping lovers and fashionistas alike should look forward to their shopping experience on board. Michelin-starred Spanish chef Ramón Freixa welcomes guests to dine in a social setting at the exceptional HOLA! Tapas Bar. Guests can share a variety of Mediterranean dishes. Interested in discovering the ship for yourself? Then browse our amazing cruise deals with the MSC Bellissima or ring an Australian-based cruise specialist at Cruise1st on 1300 857 345!